Tablets are great, unless you actually need to get some work done, when you soon discover that typing on a touchscreen is a bit like eating with chopsticks - it can be done, but there's an art to it. 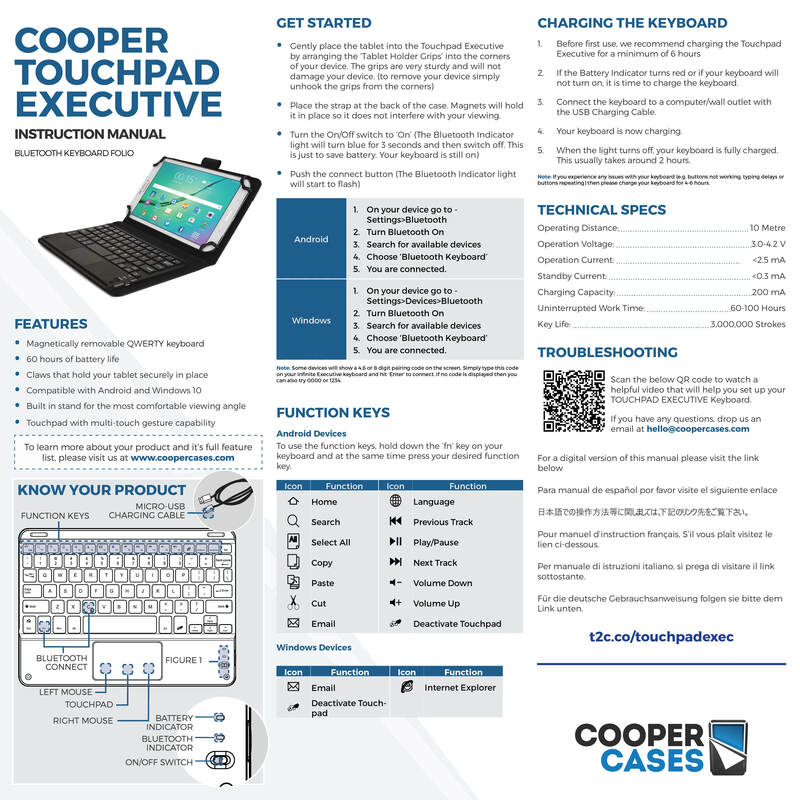 The Cooper Touchpad takes the frustration out of drafting text and keeps the screen smudge-free thanks to its fully functional touchpad. And the ultra-slim keyboard can be removed from the attractive, businesslike case for when you want to leave the office behind. It also comes with a mouse touchpad for easy navigation that will work great with Android and Windows tablets (but not so much with Apple, who don’t play nice with other people's mice). QWERTY keyboard compatible with Android and Windows. Control mouse on screen with built-in touchpad (right / left mouse click on touch pad). Easy setup Bluetooth automatically connects with tablet. Features laptop-like keys; shortcut keys to tablet's native functions; 10m range; 100 hour rechargeable lithium battery. Keyboard/mouse, bluetooth. It was just what I was looking for and part of a nice folio. Planned to use it for an 8 inch nuvision windows 10 tablet. Trouble is, it just wont connect to the tablet nor an android tablet or even a cell phone. the devices see something called nautilus and charge2 but they just wont pair or connect. Wasnt a complete waste, Nice folio !! Brian D. Y. Reviewed by Brian D. Y. The case does not have an opening for the camera lens. The keyboard was slow and unresponsive, the mousepad wouldnt click, the arrow wouldnt move and it was just easier to use the touch screen defeating the purpose for the entire thing. It was a nice case though, but after taking the keyboard out, it didn�t hold the tablet well. Battery would not charge. The product did not come with a charging unit, so you are left with trying one you have, of which I tried four and none would charge the unit. I returned it. Andrea S. Reviewed by Andrea S.
Very nice case. Love it! The case is sturdy and has a nice feel to it. My nexus table fits well in it. It was pretty easy to set up the Bluetooth connection for the keyboard.